My 8-year-old son, Anthony, came into my den while I was watching video of the devastating tsunami that hit up north a few days ago. We're untouched here in Kyoto, but of course he's heard that some bad event happened. I showed him a few of the less graphic videos, and described a bit about the hardship that the survivors must be enduring. He seemed to grasp that it was a bad situation, and wandered off. This money is from my allowance. Now, earthquakes and tsunami are happening in the Tokyo area. Therefore, they don't have electricity. Not having electricity must be bad so please send this money. 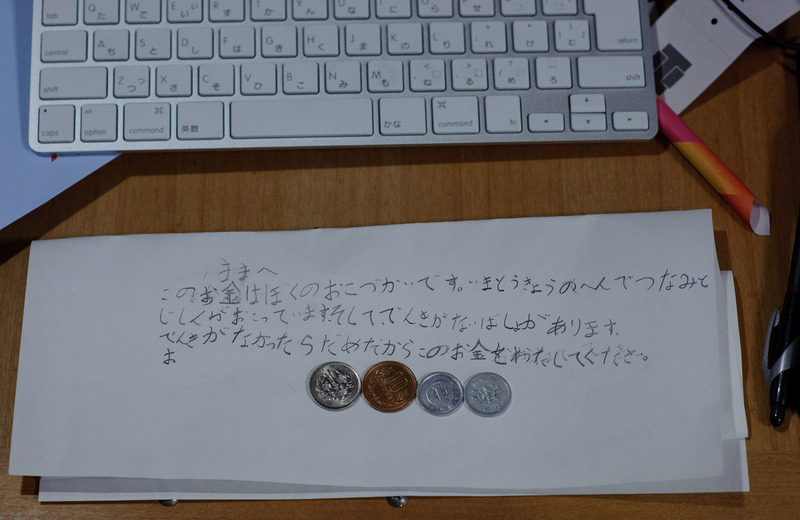 He placed 112 yen (about $1.25), which I think is all he had left after a recent shopping trip. Of course, his selflessness chokes me up... but I hesitated whether I should share this on my blog for fear of coming across as the over-proud parent I am. But on the Japanese news they're reporting that governments in the affected areas are faced with an awkward problem... there are so many people here who want to do something to help in a meaningful way, but when it comes down to it, individuals entering the wasteland to help probably make more trouble than good, so at this point the governments are turning away all but large professional organizations that can look after themselves as well as those they're trying to help. At this point, the best an individual can do is send money to those large organizations. You can donate $10 via your cell-phone bill by texting “REDCROSS” to 90999. Google US has an English site for donating to Japanese Red Cross Society. If you use Apple iTunes, you can donate to the American Red Cross via your iTunes account via this link. Yahoo! US has a links to organizations that can help in Japan, including the American Red Cross. I feel an overwhelming sense of helplessness being so close but not being able to do anything, so perhaps if my boy's note inspires someone to help, I've done something. Children so often speak from the heart. We as parents would do well to follow where they would lead us. You can’t help but feel overwhelmed when you watch videos of those waves of water wash away entire villages and towns. Sounds like you’ve done a great job with your boy. I only hope Jeffrey and I do half as good a job with Ellie Graye! thanks for publishing this wonderful expression of empathy from your son. No need to be shy about it, you can be very proud of your son. Thanks also for the hints as to where to donate. Just to agree with Chris – I couldn’t have put it better. I feel Japan gave me so much during my visits, and I can never repay that. But thanks for the Red Cross links, I hadn’t seen any appeals here in UK so far. You have a wonderful son and may God continue to bless him. Thank you for your wonderful photos expressing that hope for Japan that must never fade. I’m glad you posted this story – I found it very touching. That sort of mindfulness about others is what society really benefits from. You have every right to be proud! Anthony is a very sweet boy. I usually show posts related to him to my A. He is especially enamored by Anthony’s star wars Lego collection. It is so sad that tragedy at such a scale happened. Japan has always been our favorite even though we are yet to make a trip. Thank you for all the links. Sweet. I will show Anthony’s cousins and hope they will be inspired by his example. Your son is wise (and sensitive) beyond his years. I’m certain you and your wife are very proud of him just as my wife and I would be! I always enjoy your posts on photography – and this time you and your son succeeded in inspiring me to donate to the American Red Cross and their efforts in Japan. Glad you and your family are safe. I’m glad you posted this and I’m also happy to hear that your family is doing ok with all that is happening over there. When I read this, I was just moved. This is why kids are so awesome! Wow!